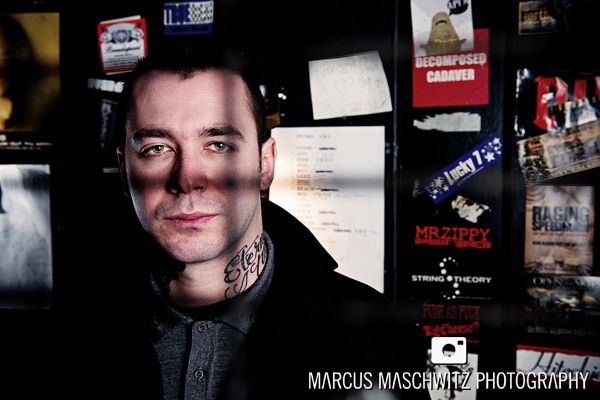 10 March 2010 – A few weeks ago I shot some portraits with Stuart Gili-Ross of Gallows for an interview with him by Rock Midgets and the interview has just gone live so I thought I would post 2 of the images that I like from the shoot. 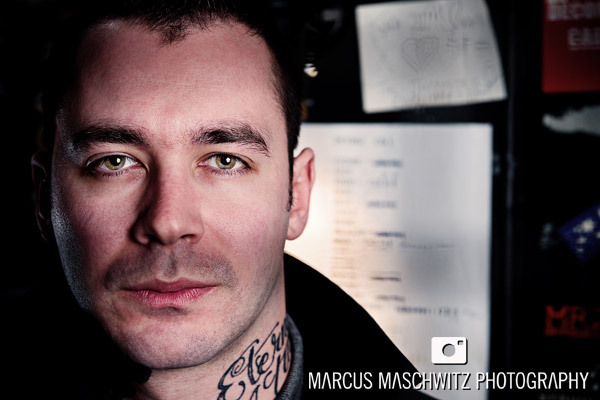 Stuart not only plays in Gallows but also in the band Spy Catcher so I wanted to make sure that the portraits are strong. The location that I shot in was really dark and “dingy” and I had very little time as I had another shoot to get to and transport put me out a little with time but I made a plan and lit up the caged DJ booth in a way that I thought would work well. The top one is my favourite and the few people that I have shown it to in secret have really liked it so I hope you do to. Make sure to check out the interview because it’s really interesting. His eyes are so sharp and beautiful. Everything worked perfectly. Well done! WOW love his eyes, what an awesome portrait! Fantastic shots Marcus, I was keen to see how these turned out.